I’m so excited to share this post with you today. The fine folks at Chairish contacted me about building a style board for a home bar. If you haven’t heard of Chairish you are missing out. 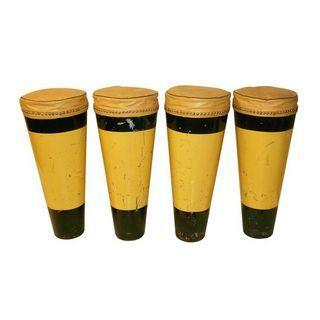 Its an exclusive curator-approved, online marketplace for vintage furniture. Not only can you buy but you can sell! What I like most is that the pieces are mostly unique and vintage with lots of style. When they said home bar I immediately thought of my poor hubby. Before the twincesses my husband had a pretty sweet game room upstairs, complete with two tvs, mini fridge for his adult beverages, storage for his cigar collection and all his NFL jerseys on the wall. Fast forward three years and he now shares the room with the twincesses as a play room. So think two screens but they are on a constant loop of the Disney channel and Frozen, his mini fridge now contains apple sauce and juice boxes and on the wall next to the jerseys are the girls artwork of the day. Poor guy just looks pitiful surrounded by all that pink in his manly man cave. So when Chairish asked me to build a room around these bar stools. I immediately thought about a man cave for my hubby. 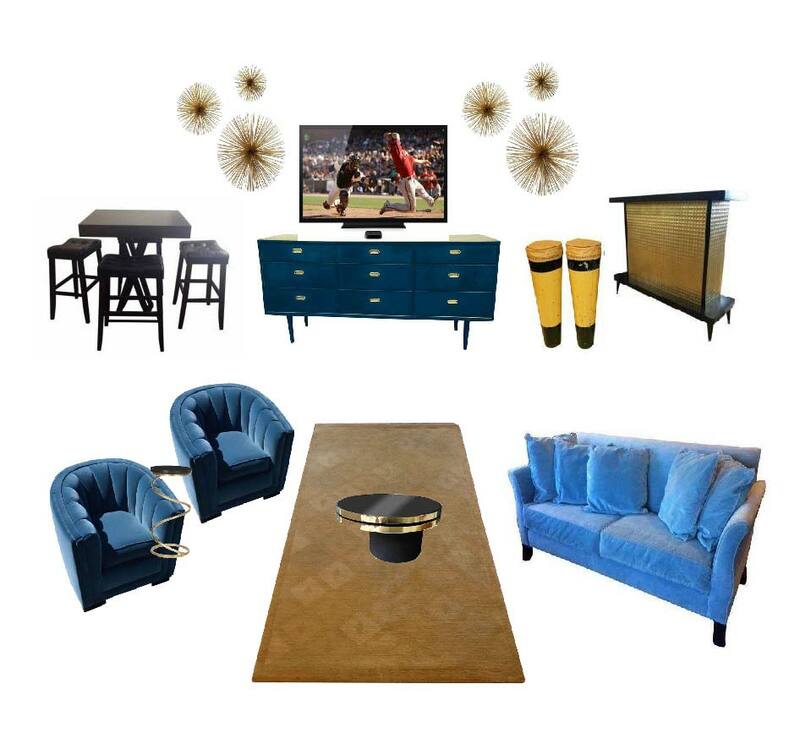 To him the Ultimate Man Cave starts with a bar and once I saw the gold mid-century bar and these amazing Blue velvet club chairs. I knew I had my color scheme of golds and blues. I scoured the Chairish website and found all these amazing pieces to make this game room come alive! Mid-century Wood Bar Beautiful bar for adult only drinks! no Twincesses allowed. ‘Nocturnal’ Custom 9-Drawer Dresser I love using pieces in unexpected places. Even though this is a bedroom dresser it adds the perfect pop of color and functionality to the room. Storage for remotes, games, and cigars and it can even be used as a buffet for food when entertaining. Blue Velvet Tub Chair these chairs in velvet add sophistication and color.Custom Blue Velvet Sofa what is that velvet? 70s Glam Pivot Coffee Table I love that this table expands out to double its size, plenty of space for chips and dip. Hand Made Rug from Nepal this gorgeous gold rug brings it all together.Metal Starburst Wall Sculptures – Set of 3 Had to add some gold to the walls as well. And there you have it! Everything you see is from Chairish. One day in about 16 years when the girls are off to college, I’ll put this plan into action for the hubster! What would you have in your man cave?